Doesn't that picture make your mouth water? 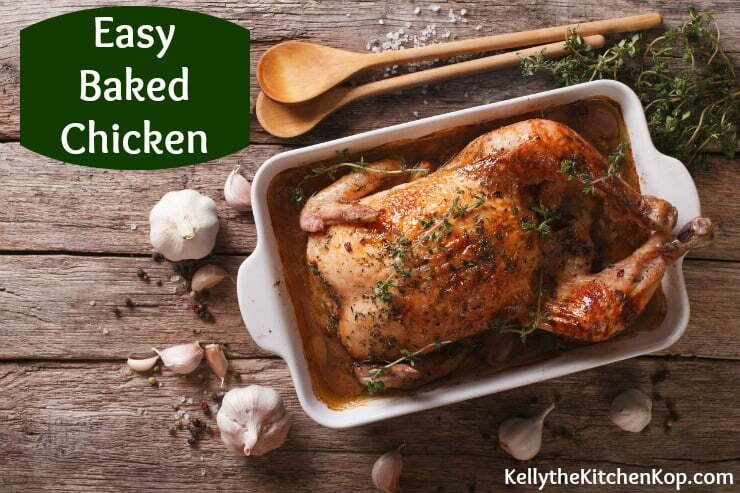 A reader recently asked: “Where can I learn how to bake a whole chicken?” I'll show you how today, it's easy! Note that if you just want some broth and meat to use in recipes, see this post on how to cook frozen chicken in the pressure cooker. The following recipe however, on how to bake a whole chicken, will give you a nice crispy skin and is a great, simple feel-good meal that everyone loves. 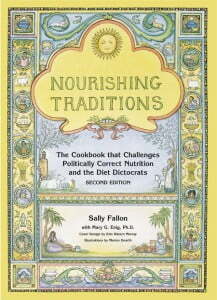 I am completely overwhelmed by traditional eating and all that it entails since that is not how I have been running my kitchen :o) I just ordered “Nourishing Traditions” to try and learn more. I thought a good place to start would be to make the bone broth you discussed. I found your directions for the broth and chicken soup, but confession of all confessions… I can't do step one: make a chicken dinner! I have never in my life cooked an entire chicken or turkey. I always just cooked with chicken breasts, thinking that was healthiest. Where can I learn to make a chicken? I bought a small organic chicken this weekend and put it in the freezer. My husband has fears; he asked, “Aren’t there bones in that?” This is probably a sad commentary on society that my husband actually fears his chicken coming with bones, and that I don't know how to cook a chicken with bones! Any direction you could point me in would be helpful. First thaw it safely – in the fridge for a couple days or in cold water for a few hours. Preheat the oven to 450* — this temp helps it have a crispy, dreamy flavorful skin when it's done. Rinse out the cavity, pat dry with a little paper towel, and place breast-side down in a buttered baking dish. (Some say breast side UP, others say DOWN makes it juicier.) We use our stoneware that has a cover, but you don't have to use a covered dish. Salt and pepper the cavity of the chicken for extra flavor, but we forget sometimes. Again, you don't have to do this, but it adds more flavor: use your hands and spread some softened butter around the outside of the bird, then season well with sea salt, pepper, and other herbs and spices you like, such as garlic powder, onion powder, some Italian seasoning, paprika, thyme, rosemary, etc. Even if you don't use butter, at least salt and pepper the bird. You could also throw in hunks of washed vegetables cut into chunks, like potatoes, carrots, celery, onions, and some garlic cloves too. Bake a 3-4 pound bird for 50-60 minutes, or until a thermometer inserted into the thickest part of the thigh registers 165*. Larger birds and those filled with stuffing take longer to cook. You could flip the bird over part way through cooking to get it brown on both sides. If you cook it uncovered (gets more golden brown this way), just watch it and if it starts to get too brown, cover with some foil. Meanwhile, make gravy from the pan drippings! Here's how to make gravy. Carve and serve the chicken and enjoy. Be sure to save the bones for chicken broth! Here's how to make bone broth. Chicken alfredo or this GF chicken alfredo recipe. Homemade chicken noodle soup of course! You'll remember my Anne from her popular article, Eating Healthy Shouldn't Cost an Arm and a Leg. This is truly the simplest meal. It literally takes less than 5 minutes prep time, although you do have to think about defrosting the chicken and have to be available to turn the chicken. I usually do this for Monday dinner just to get the week started off on an easy foot. I start the bones boiling for broth after dinner Monday and often will have chicken broth soup for lunch Wednesdays. No one tires of having this once a week. I often pull a chicken out in the morning and when the kids get home from school around 3 or 4 I have them throw it into the oven and we eat at 5 or 6, it's that simple. I haven't made this meal myself in a long time! Also, I have a convection oven and this will shorten your baking time. The results aren't as predictable, but you could also do this with a frozen chicken, just add 30-60 minutes baking time at 400* instead of 450*, and when it comes out, if it's still a bit pink as you cut it up, put it back in the oven for a few more minutes. Broiler chickens are usually about 5 pounds. The picture here is Kent getting a chicken ready for the oven. He added a little organic chicken broth to the bottom of the pan instead of water to make extra tasty gravy. Let me know how your chicken comes out or if you make yours differently? Be sure to read more tips in the comments! Forgot to get your meat out of the freezer? (I do this ALL of the time.) Here's how to cook frozen meat FAST! Need more passion in your marriage? Have you seen these creamed soup alternatives? Do your kids eat junk food when visiting friends or family? You can never go wrong with a roast chicken! when i make chickens in the crockpot i take it out and lay out the pieces as best i can on a cookie sheet and put it in a hot oven to crisp up the skin a little while i am finishing up the rest of the meal. makes everyone happy. For sides we just use all the yummy veggies that it cooked with and use the juice to make gravy for over the top. Ps I also stuffed the chicken with cut potatoes! I tried the crockpot way… Absolutely loved it!! I thawed it out, took out all of the goods inside (as I planned on a oven baked chicken), then I saw this… And fell in love with the simplicity & less work of the crockpot… after cutting up onion, carrots, garlic, celery, I then placed in my salt & peppered the chicken… Then topped with remaining cut up goods and filled with 1/2 cup of water… Set on low & let it cook… I woke up at 7am approx 10 hours later to an amazing aroma from all of the yummy goodness! I have yet to taste, but I’m sure it will be absolutely mouthwatering & delicious! Thank you to everyone that contributed to the post… Special thanks to the author! This was sooo helpful! Can’t wait to taste it! What sides did everyone make with their chicken? What did you do with all that chicken meat? If you don’t have a roasting rack, you can raise your chicken off the bottom of the pan (to prevent sticking, etc.) by making a rack of veggies. Cover the bottom of the pan with celery stalks and carrots cut in half lengthwise (so they lay flat) and set the chicken on top. When it’s done, the veggies can go into the stockpot, theoretically – but it’s hard to resist eating them, since they’re slightly caramelized and infused with rich pan juices! Woohoo! Wasn’t it yummy? You don’t have to wait until you have more bones for broth, you’ll get a lot of goodies from what you have, and then SOUP with your leftover chicken! 🙂 Good job! I finally did it! I bought an organic whole chicken and (with the help of my DH) cooked it, ate some of it and cleaned the leftover meat off the bones. Delicious!! I put the bones in the freezer to wait until we do it again and I can make a big pot of bone broth. 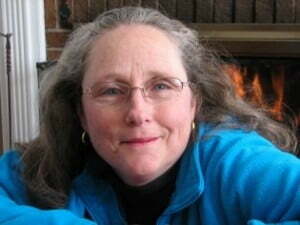 Thank you Kelly for blogging and thank you to all of you who comment, it has given me courage and guidance. Elaine, seems like this has come up before but I can’t for the life of me now remember what I’ve read. If anyone can pipe in to enlighten us, please do. All I know is that I do cook mine much longer, to get all the goodies (nutrients) out of the bones. Mary, as far as I know (not much), the gel (and benefits of gel) are there even when it doesn’t “gel up”, it just depends on how much it’s diluted so sometimes it’s more obvious than others. I definitely strain out my bones – the fact that they all fell apart just means it cooked long enough to get all the minerals out of them. I don’t mess with a cheesecloth, though, I just use my rather fine strainer. Tara, I’m belly laughing about your story. So are you my neighbor, Kenna’s, niece?! I think we’ve met before, right? They’re the stars of the neighborhood these days with their precious long-awaited baby girl! Easiest way of all is on the grill.Marinate the chicken with olive oil, lemon,garlic or whatever herbs you like. Open a can of beer,drink (or pour out) about a third of it. Sit the chicken on the open beer can, so that when it gets hot on the grill the beer will bubble up and “baste” the bird,keeping it nice and moist. You watn the grill to be hot, I usually keep one side of the grill very hot, and perch the bird and beer can in a metal pan on the other side of the grill,away from direct heat.Close the lid andl et itcook about 20 min per pound,same as in oven.Or until about180 degrees F. If you google “drunk chicken” you’ll see all the variations on this simple, delicious chicken, perfect for hot summer nights when you don’t wantto cook indoors. Love the Chix stories 🙂 The first time I baked a pastured chix it was still partially frozen. I called my MIL and asked her if there were any goodies inside or if I could just throw it in the oven – since I couldn’t wait. I decided to bake it right away and when I went to check on it, I lifted the lid and the neck was standing straight up “looking” at me. I screamed and dropped the lid. Who knew chickens actually had necks??? LOL I didn’t notice it before since it was frozen and stuck down. 1) I’ve often done broth from my bones, before knowing any special health stuff. Just figured it was healthier and more economical than store-bought. So I don’t know all the NT type benefits and instructions. What’s the deal with having the broth gel? Is there some secret health bonus if it gels? I just do mine and sometimes they gel sometimes they don’t. I never gave it a thought. But now you’ve got me worried. You know, the, “Maybe I’m doing something wrong!! !” feeling. One thought to share — it seems like I’ve heard that you don’t want to cook the broth for long periods of time because the fat does that oxidation thing (sorry, I’m not a chemist). I think I’ve heard 4 – 6 hours is plenty for good, rich broth. Can somebody help me out with explaining this better? Hmmm…I’m currently making my 3rd batch of chicken stock – with a whole raw pastured chicken. The first time I used the vinegar and an organic chicken I bought at Whole Foods, but I didn’t get a lot of gel. I even added some extra store-bought gelatin. The second time I tried some neck bones from a pastured chicken – and it gelled really well! I have high hopes for the pastured chicken on the stove right now. I actually didn’t know you could use leftover bones and bits of meat/skin from a roasted chicken…thanks for that tip!!! I love roasted chicken, and was getting used to the idea of only having boiled chicken!!! Silly me. I may have to try crockpot chicken…I love how easy that sounds! I might even be able to coerce my hubby into cooking chicken if that’s all it takes! Oh, I’m in LOVE! I tried the crockpot technique last night. Put the chicken in, added water, onions, carrots & garlic, set it on low and went to bed. In the morning, cooked chicken. I put a colander in a big bowl and put the chicken in the colander to cool off, and went out to run errands. When I got back I picked the meat off the chicken, dumped the bones back in the crockpot then dumped all the accumulated juices in the bowl in crockpot. Much better than putting the chicken on the cutting board and having juice all over the counters, lol. Then I added some vinegar to the crockpot, and later I’ll add some chopped veggies and maybe some more water and turn it back on. Tomorrow – broth! This is a whole lot easier than wrestling with my big stock pot! I roast a chicken every Monday in the crockpot. I can do different sides to go with it each week and change the whole meal up. Then after dinner I put all the bones back in the crockpot with the drippings, add water, vinegar, celery, onions, garlic, etc. and turn it on low. Tuesday night or Wed morning (24-36 hrs. later) I strain it and freeze the broth. It has been so easy, and I always have broth for anything I need/want. The bones crush easily between my fingers, and the broth gels nicely. It’s actually richer because there’s less water, but I can dilute it if I need to some. If I am baking a chicken in the oven, I always fill the cavity (after I have pulled out the “Yucky stuff”) with an onion, a few cloves off garlic and fresh herbs in the summer. Parsley, chives, thyme, orgeno, etc.that come straight from our herb bed. In the winter I add carrots and celery to the cavity. I then place the bird in a 9×13 pan drench it with olive oil and more dried herbs. I baste it a few times while baking. After I roast it my family also fights over the delicious crunchy skin. If I want chicken for soup or casseroles, I just throw it in the crockpot with onions, celery and carrots. I do not add water, and I end up with a 1 1/2 to 2 cups of wonderful drippings. What great timing again. I just purchased 5 whole pastured, but not organic chickens last night and will be getting 5 more in July and September. I asked the person for true and tried recipes and she gave me her email. Once I start emailing her, and get recipes, I can pass on any that I try. OK, I must inject my manly ways of cooking whole chickens. A grill is the best. I do it a couple different ways. One of our favorites is beer-can chicken. Yes I know, beer cans aren’t very traditional or even healthy, but you don’t have to drink it. I generally buy a beer I don’t mind drinking (i.e. no Budweiser or other ratty beer). You don’t have to have one of these, but I have a little beer can/chicken stand. First drink half the can of beer (or poor it out). You place the beer can in the stand and then pull the large opening of the chicken cavity over the beer can opening. Then rub your favorite spice blend all over the chicken and maybe shove a small onion or some garlic cloves in the neck opening. Place on the grill (or in the oven with a pan underneath) and cook on medium until done. This makes for a tender and juicy chicken with a lot of flavor. You can also put herbs into the beer for extra flavor. Since I’m living in a camper right now and stuck with one of those mini-grills, I grill chicken halves. Place the chicken back-side down and take a large very sharp chef’s knife into the cavity along one side of the spine. Using a fair amount of force you will cut through the rib bones and then do the same on the other side of the spine and remove the spine. Then you can spread the chicken apart and cut the other side in half. You may need to pull out the breast bone to do so as it’s pretty thick. Season both halves on all sides and place bone side down on the grill and grill on medium or medium low. The longer cook time will produce a crispier skin. We’re also a fan of the crockpot method. I think I’m going to do the crockpot thing tonight myself. I have lots of chickens after having to hoard all spring due to shortages. Kim’s method is perfect for me since I work and do all my big cooking on the weekends. If I roast, I have to remember to thaw a couple of days before, and that’s the hardest step. Now I’ll cook the bird Friday night and have all weekend to make “stuff”. Yee-haw! Thanks for the tip, Kim. Geesh you guys, you got me wanting to make a chicken right NOW. It’s 12:43 am, so I’m going to use your idea, Kim, and everyone else who suggested making it in the crock, and start it right now for tomorrow’s lunch/dinner. It will work out perfect since bible study is here tomorrow night, and I’ll be busy getting ready and won’t have time to make anything…here I go to get it out of the freezer…except, I hope there’s no gunky weird stuff inside it that I’m supposed to pull out first…? Guess I’ll find out in the morning. Ooooh, that IS the best of both worlds!!! I wonder if mine can go into the oven……. Sometimes, right before I head for bed, I put a whole frozen chicken in the crockpot with chunks of onion, carrot, celery, and crushed garlic cloves, cover it with water (about 1-2 inches from the top), and cook it on low all night long. It smells so good in the morning! And we can have chicken sandwiches or soup (made with the now-broth the chicken just came out of) for lunch that day, or a casserole for supper. I also will cook the bones for broth (with the apple cider vinegar and about 2 quarts of water) overnight in the crockpot. Delicious broth in the morning, cooled and in the freezer by mid-morning. I cook my whole chickens in a covered roaster pan. It is one of those speckled black pans like your grandma may have had. A whole chicken is one of my Sunday dinner items. 250 degrees all morning while we are at church. My boys think it is great fun to gather all of the bones, unwanted skin, etc. off everyone’s plate and put it into the stock pot. In the interest of “easing into” this whole cooking thing here is a thought…one of the first times we made homemade chicken stock was when we had purchased a rotisserie chicken from the store (I know, I know!) but we used the bones, skin, little bites people didn’t eat and made our first stock. It was fabulous and really got us heading down the path of doing the whole thing from scratch without taking on the entire process ourselves for the very first time. Kelly, Thank you so much for your post and I’m loving all these other tips! What a fountain of information for newbies like me! Hopefully it will be fall-off-the-bone tender since I have to debone it for my hubby! Thanks for the tips on the stock! I do use the apple cider vinegar & basically do the recipe from Nourishing Traditions. I will try cooking it down more next time. Thanks sooo much for all the encouragement. 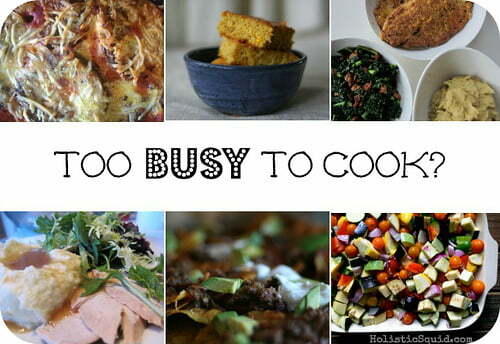 Real food websites and blogs have really inspirted me. I feel much more connected & empowered – that I’m not the only one out there trying to do this. You’re all great! Teena – I just had to say, I was sooo there! When i got married 8 years ago, I wouldn’t TOUCH raw meat. Hamburger patties? Thank goodness the store sold those premade! I wouldn’t touch the turkeys we made for thanksgiving! And chicken – seriously only bought boneless skinless for years! It does get easier and less gross though! Try buying some gloves like they use at restaurants. It helps you get used to it without having to feel all that slimy yuck! *and I also have to say – the feet still gross me out and I can’t get myself to go there yet! Cavity, carcus, feet…ewwww!!! I have a hard time making hamburger patties because I don’t want to touch the raw meat. I leave that up to my husband for now, but I plan to get over my fears so that I don’t pass them onto my kids. I’m so thankful to those who post, it gives me strength. I always do my whole chickens in the crockpot — even when we’re camping! My large crockpot will hold two chickens. I only season them and occasionally add onion or celery to the cavity — I don’t ever add any liquid. It doesn’t get any easier, especially on a summer day! I am another chicken-in-the-crockpot-all-the-way gal! It is moist, fall off the bone every time! Even for the local, pastured chickens which tend to be more tough – nope, not in the crockpot. Thanks for sharing about the vinegar in the stock pot with the bones – I’ll try that! Jessie, I’m not sure why you’re not getting some gel. I almost always use cooked bones and then get good gel, but maybe like Donielle said, it has to do with the splash of raw apple cider vinegar I always add – this draws the goodies out of the bones. Try that (if you don’t already) and let us know! OH, and as Debbie said, too, maybe you’re not boiling down enough water before you cool it. When I have a lot of water still in the stock, then mine doesn’t seem to have any gel in the morning either…but it’s still in there even if there’s too much liquid with it to see it. 1. BROTH: we always use a mixture of cooked and raw bones, and our stock gels up into a solid brick! We use one cooked carcass and a few raw backs. 2. ROAST CHICKEN: we always do it the same way. Rub the chicken all over with lots of salt the day before cooking, leave covered in fridge. Then scatter unpeeled garlic cloves over the whole thing, roast at 400, breast-side down for 20 min. Then f lip, roast for 20 min. Flip again, 20 min. Check for doneness. This allows the chicken to baste itself in the drippings! 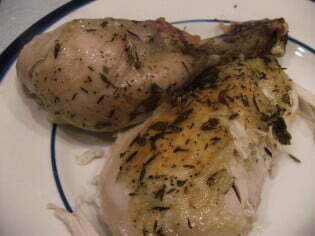 Sometimes we stuff sprigs of rosemary inside the chicken…but just garlic and salt usually make for a perfect bird. Re: gelling broth. It helps to have chicken feet. I need to get more myself – my stash was lost in the great freezer disaster of Feb. 2009. Jessie, when you simmer the bones do you add in some apple cider vinegar? That’s the only thing that comes to my mind right now. I have a question related to this that maybe people could share their wisdom on. I have never had chicken stock made with bones from a cooked chicken actually gell. Never. And I have used high-quality, pastured chickens. My WAPF leader told me you have to use raw / uncooked bones to get it to gell. And when I do that, I can. (I buy bags of bones from pastured chickens). It would be great to get the cooked bones stock to gell, though. Any tips? – I do mine in the crockpot, too, because I’m insanely lazy. I really reccommend one of those old fashioned steel frame thingies that goes under a roast so you can lift it out easily. A crockpot chicken will fall to pieces after 6+ hours of lovely, intense moisturizing. – Also, chickens in the crock stays pale coloured so the skin may appear unappetizing to some who are used to crispy oven cooked skin. Just saying. I don’t mind, but some might. – My fave way of seasoning a roasted chicken: mix minced garlic, sea salt, butter and rosemary leaves and then take hanfuls of the mixture and push it up under the chicken’s skin. Getting it under the skin will guarantee some of that flavour will go right into the meat and not just sit on top of the skin. Put any leftover mix in the body cavity (or mix up into breadcrumbs/cubes to make a stuffing) and then rub off what remains on your hands on the outside of the bird. The bad thing about cooking a whole chicken in the crockpot is no crispy skin to fight over! Seriously, we fight over the skin. LOL. Luckily, my second son doesn’t like the skin (??? ), so he hands it off to his brother, which leaves plenty for me and dh. I have to cook two hens @ a time as my family loves roasted chicken. If I had a pan that held 4 hens, I cook 4 at a time. It’s a really simple, good meal that keeps on giving. The easiest peasiest way to cook a whole chicken is to toss it in the crockpot!! It’s the only way I do mine. 🙂 After it’s thawed a couple days in the fridge, rinse it off and pull out the goodies inside. If you don’t have one of those expandable steamer baskets for veggies, you can use a few rolls of aluminum foil on the bottom if you have to. Place breast side down (the big smooth side!but if you can’t figure it out – it doesn’t really matter) and let cook on low for 6-8 hours. The meat will literally fall off the bone! Well…almost fall off if it’s organic. 🙂 You can also season however you want, I usually just put a bit of salt and pepper on it along with a bay leaf on the bottom of the pot. Rosemary and thyme are good too! This is just one of those dishes that seems harder than it is! Great tips, Catherine, thank you! There are also a few tricks you can do with the temperature that make for really yummy “fall off the bone” chicken. -Place the chicken breast side down. This will let the breast marinade in the chicken drippings as it cooks. It makes the breast meat incredibly juicy. -I start cooking at a really high temperature 450F and every 15min I will lower the temperature 25F. – After the bird has fully cooked (check with a meat thermometer), I don’t take it out of the oven right away. Instead I let it sit in the warm oven for 30min to 1 hour. This cooking method just blends all the flavours so nicely. The texture of the meat is so juicy and you can just pick the meat off the bone with your fingers. I cooked two chickens this way for some company I was having over and I was hoping for leftovers. There was nothing but bones left and even the baby was eating the chicken that had fallen on the floor.